The Color Gardens, a series of six terraced gardens each planted in a single color, stood to the north of the Vista and were reached through gaps in the walls lining the steps. The terraces color schemes were, in descending order, pink, blue, red, white, yellow and, at the bottom, a delphinium garden. Today only the last two terraces exist as the upper color gardens are on land owned by the neighboring hospital, St. John's Riverside. The lowest semi-circular terrace sits slightly higher than the Overlook. In Untermyer's day its fountain contained a cherub and dolphins spurting water. Today, one can enjoy the view of the Hudson River stretching to the north. 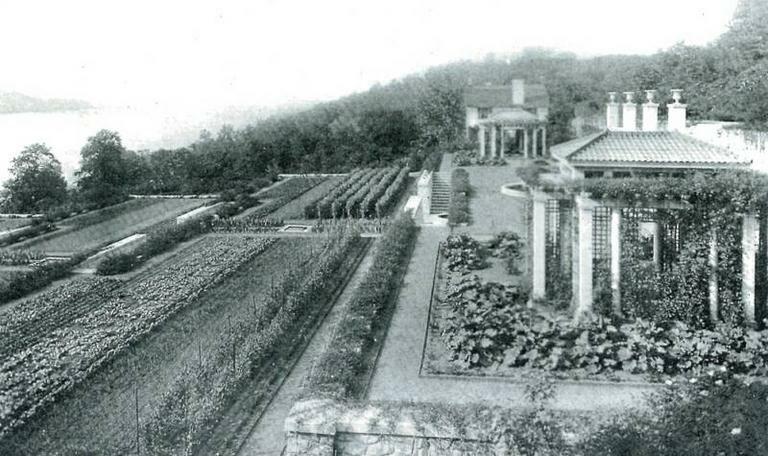 To the north of the Color Gardens were once the impressive terraced Italian Vegetable gardens. The land they were on belongs to the neighboring hospital and has been used as the site for the Adira at Riverside Rehabilitation Center. Below the Color Gardens were the Rose and Dahlia Gardens. The twelve columns remaining were once a pergola covered with climbing roses. Below the Overlook is the remains of the Gatehouse which once stood at the intersection of the estate's carriage trail and the Old Croton Aqueduct. A two story house, it has been stabilized with ongoing work to create the Ruin Garden with plantings planned for 2019. The lion and unicorn sculptures are English and symbolize England and Scotland in the Coat of Arms of Great Britain. In 2018, the lost unicorn head was replaced with a head sculpted by Chris Pelletiere.